I used to mix several types of food myself in order to give my fish a varied diet. They do not eat the same thing every day in nature and a variety is important to their health. Fruits and greens was one of the favorite foods. I can see an improvement in color after the first feedings when switching from cold weather foods. Now I only have to buy one container instead of 5 and mix them myself. 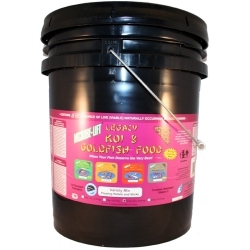 Your fish will thank you for this food!